The most logical way to increase the return on a heat press investment is to increase production speed. Add to that the versatility of a heat press and heat-applied graphics present many ways for apparel decorators to take their business to the next level. It's a simple equation. If you want to make more money, then print more. But how does an apparel decorator achieve this, and what exactly is more? 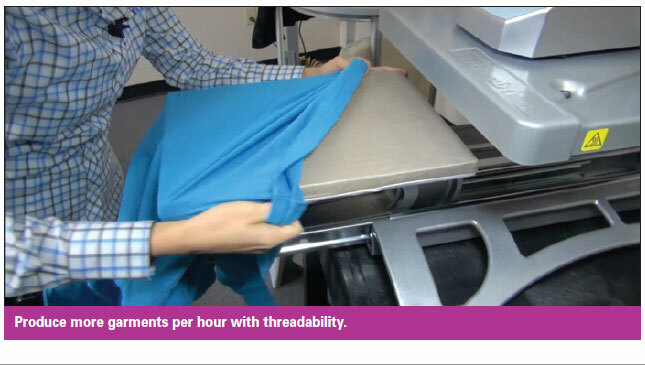 Is it printing more items per hour by increasing the speed at which you produce garments? Or can you increase profits for your business simply by printing a more diverse set of items with more finishes? Taking your decoration business to the next level and increasing profits year after year can be a challenge, and it requires your shop to print more items in a shorter time. Knowing this, thousands of apparel decorators attend industry trade shows throughout the country looking for the latest in print technologies and cutting-edge developments to print a wider variety of items more quickly, ultimately increasing their sales and profit. With heat-printing technologies and heat-applied graphics, the heat press is the most versatile machine an apparel decorator can purchase. Because of the low cost of investment, heat presses also tend to yield the highest return. 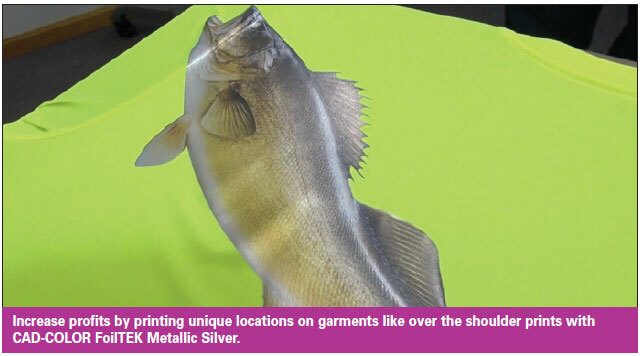 Innovations recently made to both heat press machines and heat transfer adhesives give apparel decorators new avenues to customize and print more items than ever before. The most logical way to increase the return on a heat press investment is to increase production speed. 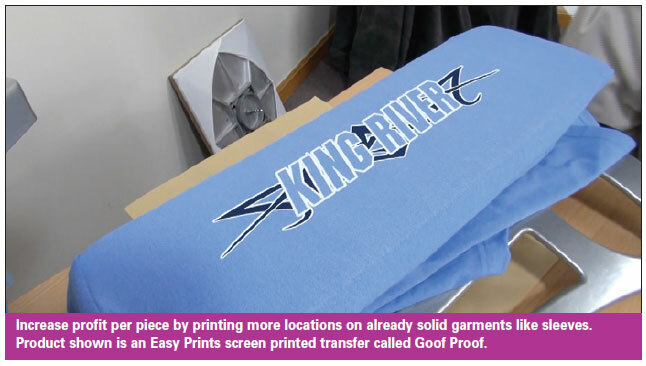 While transfer times cannot be tampered with without risking the transfer's durability, there are many ways to increase the time it takes to print a garment by speeding up the time spent loading a garment onto the heat press and aligning heat transfers. Heat press features such as threadability allow you to quickly and easily position garments onto the lower platen of your heat press to increase the speed at which you are loading and printing. First derived from screen printing and embroidery decoration processes, this technology allows decorators to open a garment and load it onto the machine quickly and more efficiently, eliminating the use of additional accessories such as heat printing pillows or pads. Separating the garment layers so that only one layer is on top of the lower platen helps to speed up the time it takes to smooth wrinkles out of a garment prior to application. Simple accessories can also be added to heat press machines to increase speed when loading and unloading a garment. 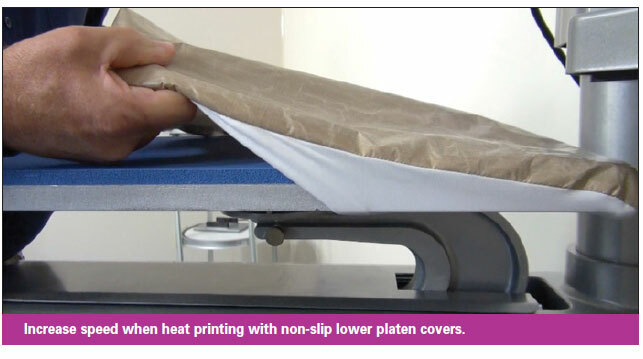 Non-stick platen covers can be slid over the lower platen of a heat press to make it easier and faster to load and dress garments. In addition to loading the garment onto the heat press, heat press operators admit that aligning graphics accurately can consume a considerable amount of time in the printing process. Transfer alignment speed and efficiency can be increased with the use of laser alignment systems. 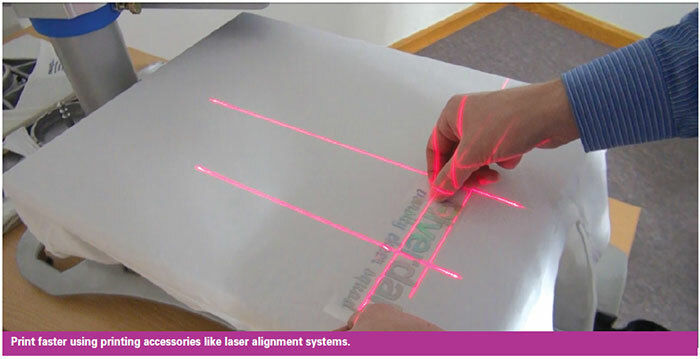 Laser alignment systems utilize independently adjustable lasers to quickly line up graphics accurately and take the guesswork out of printing with transfers. Along with increasing print speed, these laser alignment systems help to cut down on ruined garments, ensuring consistent placement and accurate positioning for every heat printing job from front center graphics to left chest logos, saving apparel decorators both time and money. You can expand apparel sales by including more opportunities to profit per garment. Adding print locations to a garment is one of the easiest ways to grow sales with every item printed. An apparel decorating business will make more profit per piece by simply offering to print more locations on already sold garments. With heat printing accessories such as interchangeable heat press platens, customizing garments with only one print location is a thing of the past. Apparel decorators used to shy away from printing unique locations on garments because the return would not outweigh the hassle and challenges of the printing process. With these interchangeable heat press platens and innovations like threadability, printing more locations is fast and easy. 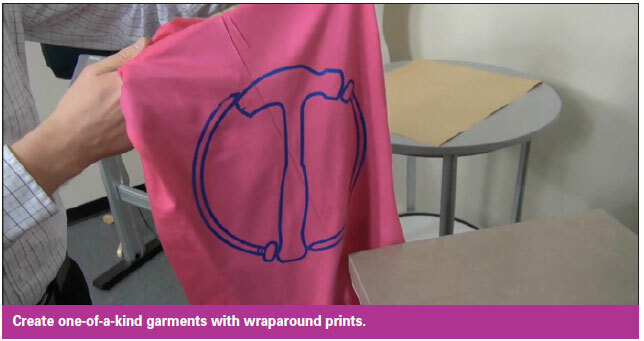 Simply open the garment, thread the area you want to print, and heat press. Imagine the new profit opportunities that can be realized when adding sleeve and full-back prints to a jacket with a left chest logo. Expand beyond the decoration of everyday T-shirts to include wraparound prints or graphics on the back of the collar for increased sales. Printing items that command higher prices will yield more profit per press. 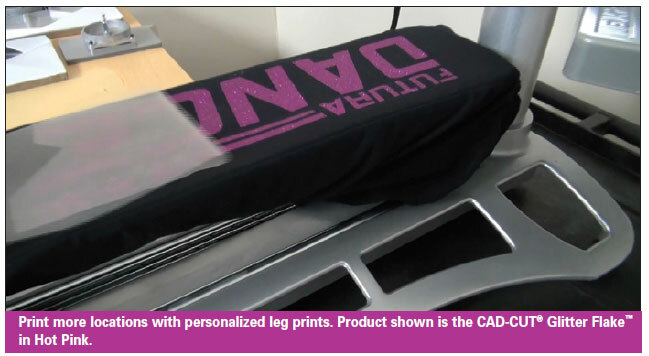 Heat printing opens you up to customizing a variety of items beyond apparel basics, like T-shirts and sweatshirts. With new heat-transfer adhesives and heat-printing accessories, it is possible to decorate virtually any fabric composition or style with your heat press including polyester performance wear, promotional products, nylon garments and outerwear. Step outside of the cotton comfort zone into the growing and lucrative performance apparel market. In today's marketplace, performance apparel commands a price tag that is twice as high as similar cotton garments. Offering customized performance apparel propels businesses into an even higher profit bracket and presents unique opportunities to expand into new customer bases with heat-applied graphics, such as athletic teams and leagues, cheer and dance teams, and small businesses looking for cutting-edge team apparel. In the past, garment decorators have steered away from printing these technical fabrics because of the limitation of heat transfers and other print technologies. The fear of heat-press marks scorching and ruining garments, coupled with heavy, inflexible transfers and the challenge of polyester dye-migration, had left decorators unable to decorate these items. New heat-transfer adhesives on the market today offer solutions that make personalizing these profitable garments possible. These adhesive technologies offer a lower melting point than other heat transfers, avoiding any fabric scorching that could occur under a higher heat. Along with the low temperature adhesive, new dye-blocking adhesives have also come on the market to prevent any unstable polyester dyes from bleeding through the transfer from the garment. 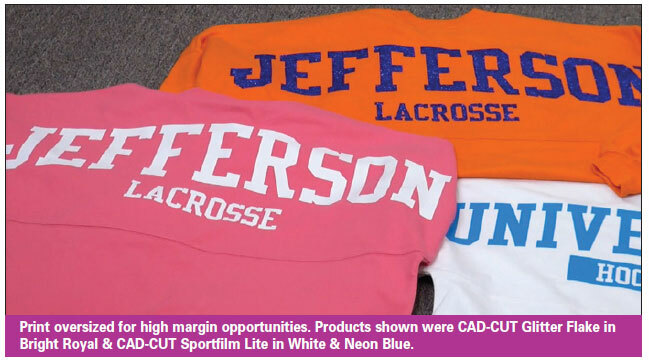 Low-temperature and dye-blocking adhesives have expanded into many heat transfer types, giving apparel decorators unlimited sales opportunities among transfer styles such as screen printed transfers, single-color heat transfer materials, and full-color graphics with digitally printed transfers. Aside from the performance-engineered adhesives, heat transfers now offer more flexibility in their composition to complement the stretch and lightweight feel of performance fabrics. These transfer innovations now present apparel decorators with the tools needed to create personalized, one-of-a-kind designs onto performance apparel from lightweight, moisture-wicking T-shirts and polo shirts to high-stretch compression garments. Printing other high-margin items and packaging them with current product offerings gives garment decorators the ability to sell more to every customer that comes into their shop. With a heat press and heat-applied graphics, expanding your product offerings to include accessory items like laptop and tote bags, promotional items such as tablet cases and pad folios, sweatpants with full leg prints, and jackets has never been easier or more profitable. 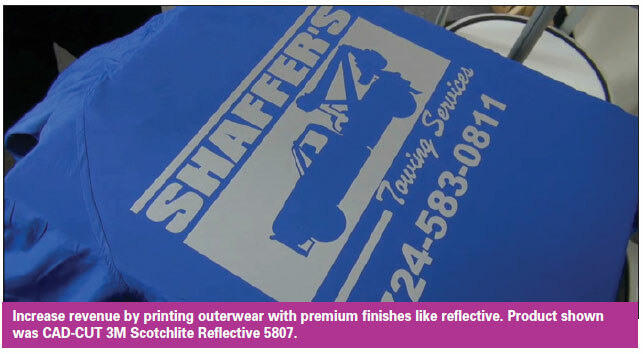 Printing premium finishes like reflective heat transfers for outerwear also presents an opportunity for a greater profit. In recent years, the "bling" trend has expanded into a marketplace of its own. These shimmery finishes are now demanding a price tag higher than basic finishes, giving apparel decorators more opportunities to gain higher returns per garment. Bling finishes, which include glitter and foil heat transfers, rhinestones, sequins, nail heads and spangles, have been difficult for decorators to create in the past without extensive software, equipment, labor and mess. Today, the heat press and bling heat-applied graphics have changed the way apparel decorators look at these finishes and now make it possible for decorators to increase their sales with customization. Because of the ease of decoration, these high-sparkle finishes are popping up in a wide variety of markets from school and spirit apparel to small business applications, opening up even more sales opportunities. 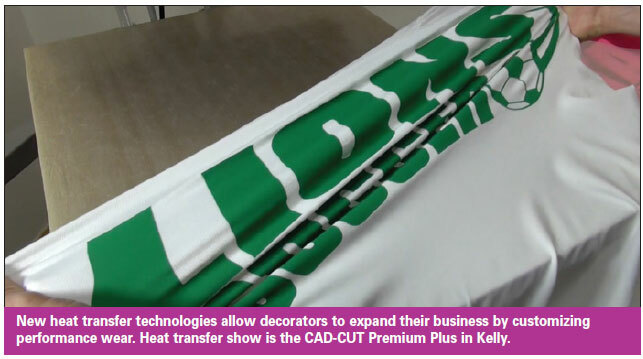 Some apparel shops rely on vendors to create bling heat transfers to cut down on labor. For those that want to create custom graphics in-house, there are a variety of materials available using equipment such as vinyl cutters and solvent print-and-cut machines. These finishes include single-color glitters, bold metallic shades and soft metallic colors. 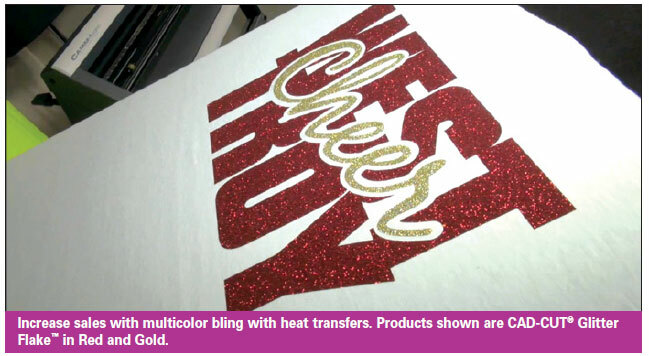 Solvent print-and-cut machines give apparel decorators the ability to print full-color graphics on metallic printable heat-transfer materials for multi-color bling logos. Regardless of which way you choose to create your transfers, all applications can be completed using a heat press. As the bling market continues to expand, decorators must find more ways to stay competitive and offer bling apparel that sells. To truly maximize the sales potential of these finishes and sell more items, get creative with multi-media looks. One way to achieve this is to mix multiple glitter shades together for a full-color bling look. 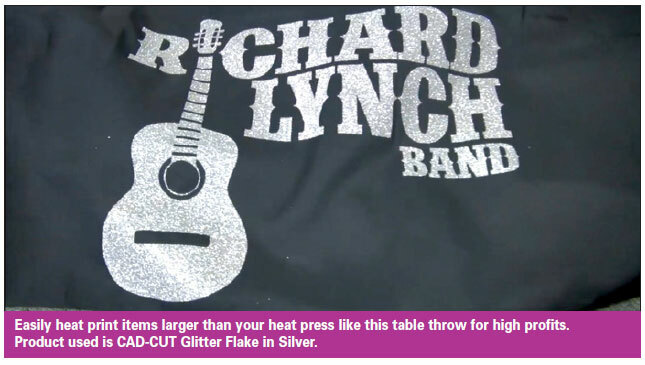 Mixing and matching multiple bling transfer styles together, such as a foil with a complementing glitter color or rhinestone outline with a contrasting glitter heat transfer, is another surefire way to send apparel sales soaring. Printing oversized graphics equals oversized profits. Whether a heat press is 11x15, 16x16 or 16x20, apparel decorators are not limited to the confines of this platen size for their graphics. Printing oversized graphics on a heat press is an easy and lucrative way to make high profits fast. A popular oversized fashion trend that can be achieved using a heat press is the oversized jersey prints. These garments are loosely fitted, oversized shirts personalized with a large bold print on the back across the shoulders. 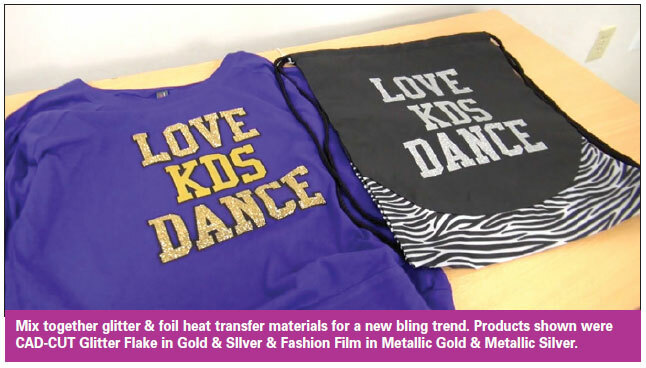 These garments are becoming increasingly popular around school and spirit wear markets and present opportunities for a high margin per piece when printed with glitzy bling finishes, like glitter heat transfer materials. Printing these items on a standard shirt press is easy. Simply load the garment onto the press so that the corner of one shoulder is at the corner of the press, preheat and slide the garment over to the other shoulder and repeat. Once the garment has been prepared for the application, align the oversized transfer with the center of the garment, then slide the garment over to complete the same two-step application used in the pre-heat step for the final application. For promotional product market opportunities, the same multi-step application can be applied to oversized items such as table throws for high profits. The versatility of a heat press and heat-applied graphics present many ways for apparel decorators to take their business to the next level. The time is here to customize and print more items even faster. New heat-printing technologies and innovations present garment decorators with the tools to succeed in creating cutting-edge apparel quickly and efficiently to increase sales and profit. Courtney Matlick-Kubitza is a Sales and Business Development Manager for Stahls' CAD-CUT Direct, the heat-transfer material manufacturing division of Stahls'. She has been in the apparel decorating industry educating customers on heat printing since 2010. In addition to educational seminars at trade shows, Courtney actively publishes sales and marketing videos on the Stahls' CAD-CUT Direct Youtube channel and presents monthly training seminars online with Stahls' TV. Courtney holds a Bachelor's degree in Marketing from Robert Morris University. This article appeared in the SGIA Journal, Winter 2015 Garment Issue and is reprinted with permission. Copyright 2015 Specialty Graphic Imaging Association (www.sgia.org). All Rights Reserved.